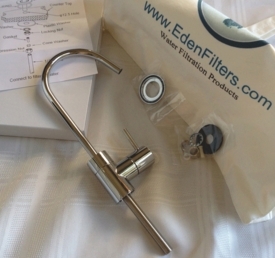 This is a simple “no air gap” faucet that has modern look for water filtration systems. It can be considered an upgrade for the standard faucet that comes with economy filtration and RO systems. This modern faucet is 8.25" tall and has a swivel spout with a reach of 4". It is designed for connection with 1/4" supply tubing or 3/8" with tube adapter. The faucet features a smooth quarter turn handle so that you control the flow. The faucet is constructed from lead-free brass with a ceramic seat for a lifetime service. It has (stainless steel look) chrome finish. The faucet is rated for maximum pressure of 125 psi.